Grab a nice round pumpkin that seems like the right size to fit your intended pumpkin pattern. See if you can find one with a smooth side where the design can go. A plump pumpkin without deep ridges is probably well hydrated and will carve easily. You'll also need a carving kit. Unless you're planning to carve the simplest of triangle eyes, leave those butcher knives in the kitchen drawer. You want small saws with serrated teeth. You can find these pumpkin carving saws in any store that sells Halloween items. 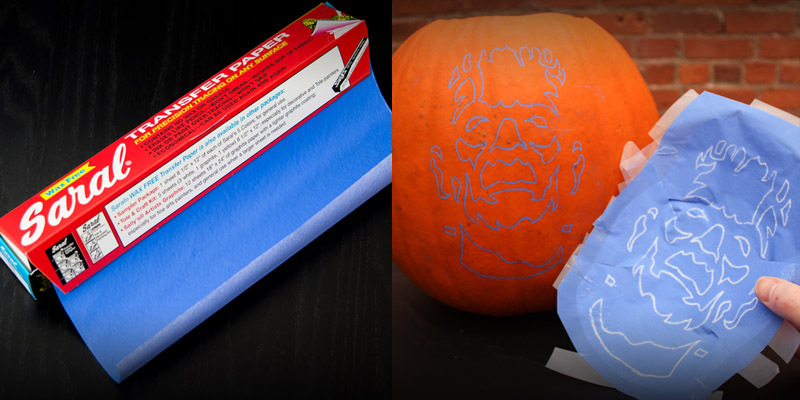 Or if you really want to show off your elite status, consider my Pro Pumpkin Carving Tool. 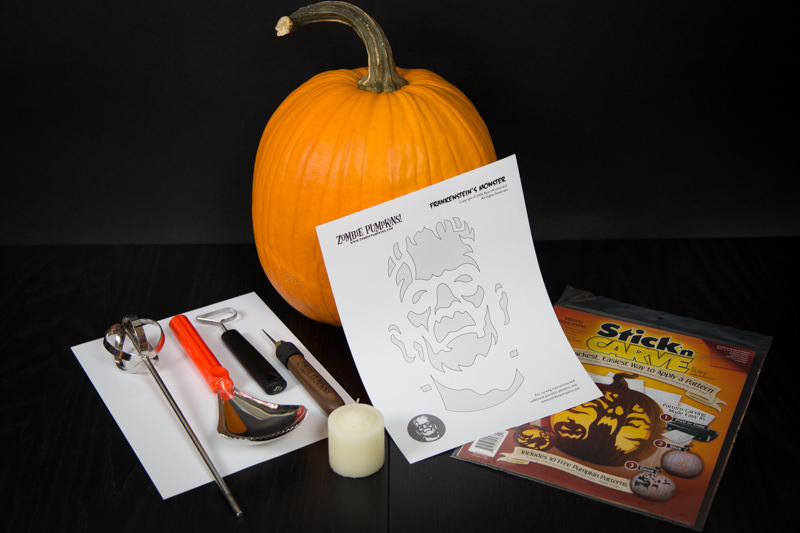 Carving kits generally come with a poking tool and scoop. 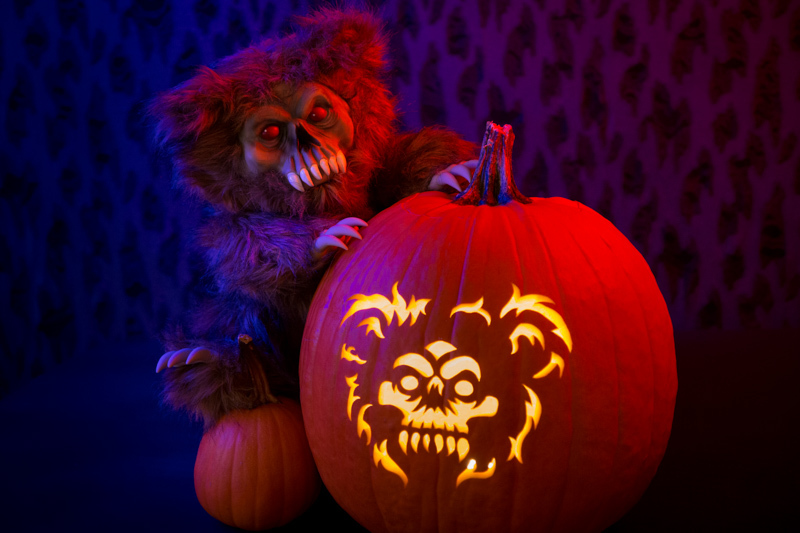 Some tape, a candle (or LED light), and a receptacle for the pumpkin guts should round out the list of what you'll need. Once you've got some jack 'o lanterns under your belt, you'll start to find alternate supplies that will become your favorites. Below you can see the supplies I personally use on just about every pumpkin I carve. First make a lid by cutting a circular hole on top, around the stem. This is one step where a sturdy serrated kitchen knife is probably preferred. Cut at a slight inward angle toward the middle, so the lid won't fall inside. Making the lid a unique shape will help you line up it up perfectly when you replace it. Make sure this hole has plenty of room to fit your hand through. Then comes gooey step that the kids either love or hate -- removing the guts! Get right in there with your hands! I personally use a very large pumpkin scoop to remove most of the seeds and guts, but a big spoon works too. See what you have in your cabinets -- maybe even an ice cream scoop. Your pumpkin carving kit may have come with a plastic scraper with a flat edge, so you can use that to scrape the inside walls clean. To get carving quicker, power tool users should consider the Pumpkin Gutter, which attaches to your drill and uses spinning curved blades for high powered smoothing of the inside. 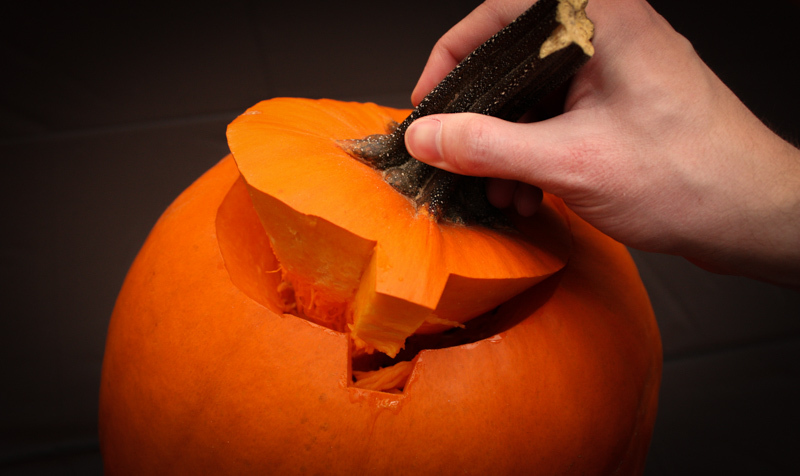 Depending on the thickness of the pumpkin rind, it might be necessary to thin down the inside of the pumpkin wall. Not the entire inside of the pumpkin, only right behind where your carving will be. I like to aim for about 1 inch of thickness. Basically you just need it thin enough to allow your carving saw to pass all the way through. To thin the pumpkin with both speed and finesse, a clay loop with a flat edge is my favorite choice. Just be careful you don't go too thin! All you really need is a poking tool, but if you have the time to acquire special supplies, there are a couple new innovations I can recommend. 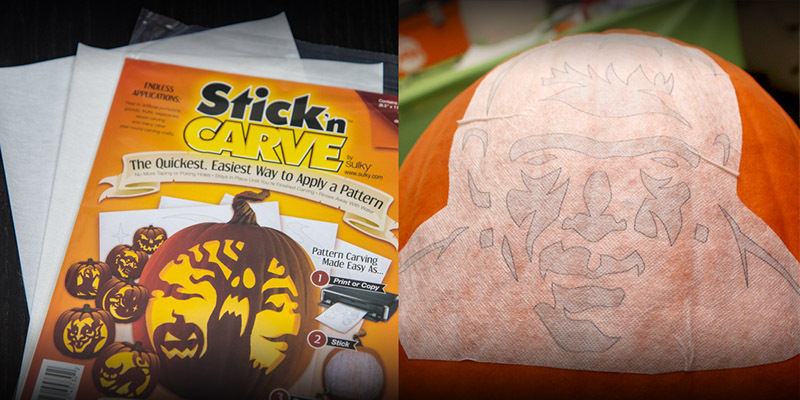 My greatest suggestion is Stick 'n Carve, which I personally use almost exclusively (and sell in my shop). You can print your patterns right onto these thin flexible sheets with your home printer. Then firmly stick the adhesive sheet to your pumpkin. Technically, you're skipping the "transferring" step, because you cut right through the thin pattern, following along the printed lines. When you're done, the pattern dissolves away with water. Another good option is Saral Transfer Paper. 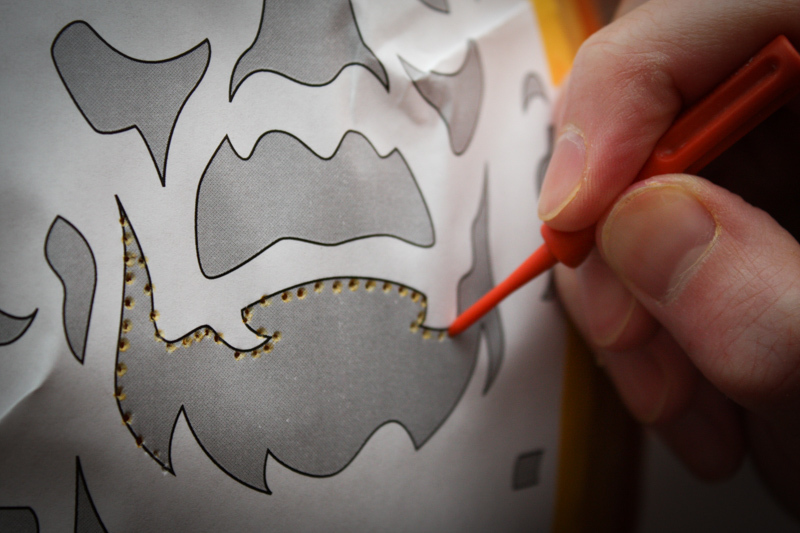 Cut out a piece of transfer paper to place between your printed pattern and the pumpkin. Tape it all down securely, and trace the lines of the design using a pen. 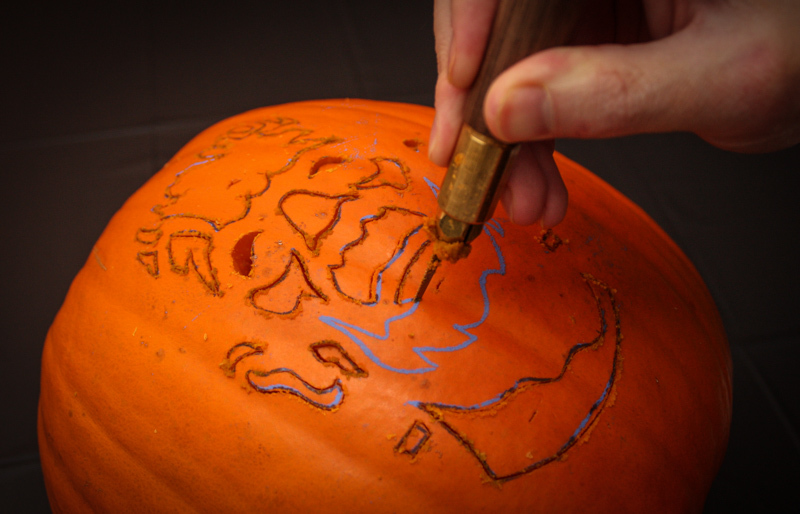 When you're done tracing, the pumpkin skin will have virtually smudge-proof transfered lines you can follow. I recommend the blue or white transfer paper for highest contrast lines. 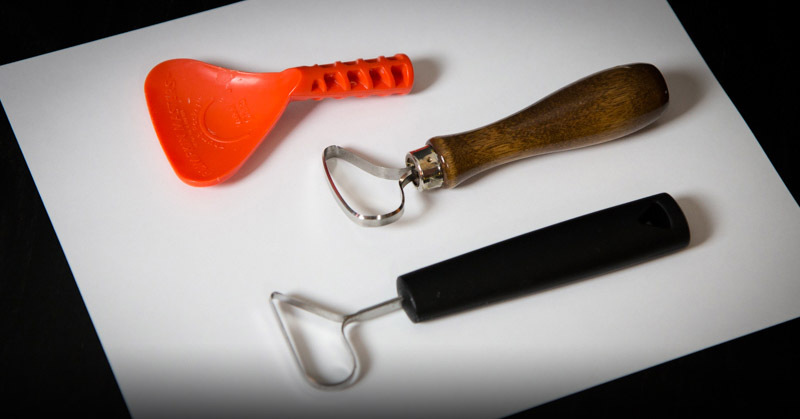 If you don't have these supplies, then you can go old school with the tried and true poking method. Like with the other techniques, cut the excess paper off from around the design, and tape tightly to the pumpkin. You can crease the paper (or cut slits) in areas that have no important design elements, to help you wrap it around the curved surface. 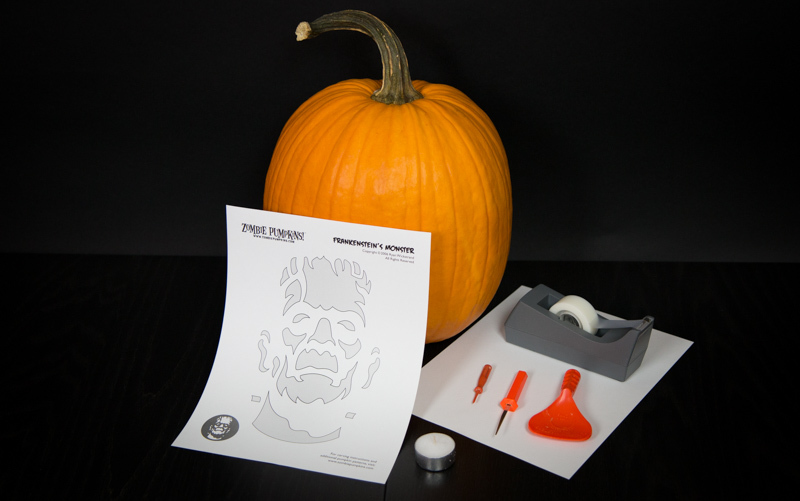 Then using the poking tool that came with your kit (or push pin), poke holes along the lines of the pattern, just deep enough to pierce the paper and pumpkin skin. Depending on the complexity of the design, make these holes 1/8" to 1/4" apart. 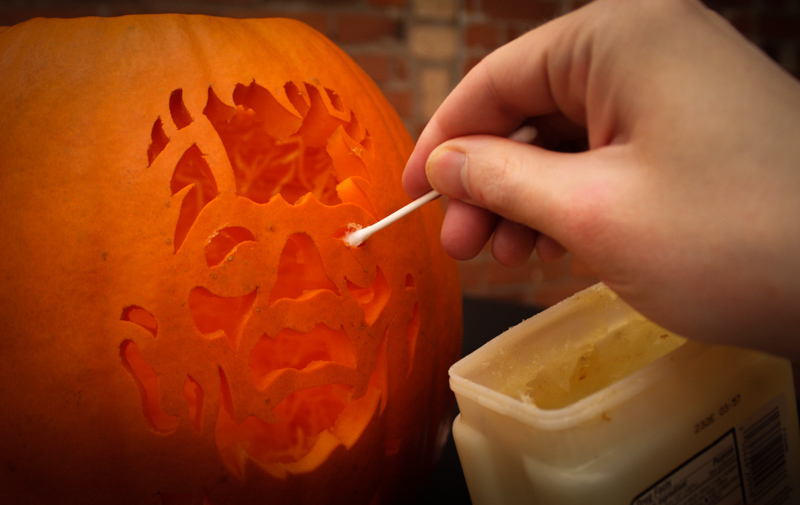 When you remove the paper, you'll have dotted lines you can follow with your carving saw. Hold your carving saw however feels most comfortable, probably like a pencil. Follow along the lines of the pattern, cutting with an up-and-down sawing motion, so the teeth of the blade can chew through that pumpkin flesh. You also want to be pushing the blade straight into the center of the pumpkin -- too much of an angle will make the pieces harder to remove and won't let out as much candle light later. Gradually turn the handle of the blade as you cut curved lines, but for sharp angles in the design, remove the saw and reinsert at the new angle. Don't twist the blade unless you want it to snap. To keep the surface stable while carving, work your way out from the center of the design. Generally I like to start with small details in the middle, like a character's eyes and teeth. Gradually work your way outward, saving the largest shapes for last. While it's tempting to poke out the cut pieces right away, consider leaving them in place until you're all done carving. This will add stability, which is especially crucial for detailed designs. When you're done, push the pieces out gently. Depending on the angle of your cuts, you might find that some pieces pull outward, while others want to be pushed in. Remove them in the direction of least resistance, so you don't break anything. Large sections may need to be cut into smaller pieces for removal. If you're having trouble telling what pieces should pop out, refer to the original pattern. The pieces shaded in grey are what you remove. People often ask how I get my carvings looking so clean. 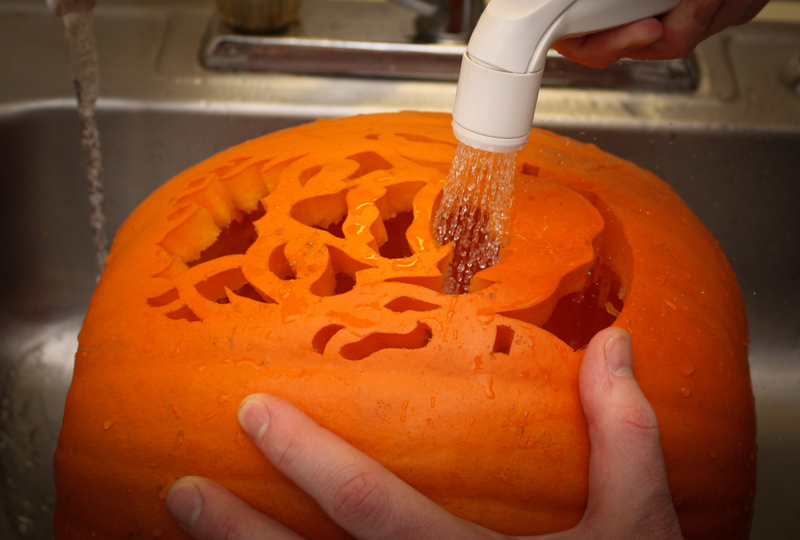 My biggest tip is to bring the pumpkin to the sink for a final clean up stage. Let water run through all the cut holes -- a sink spray hose is perfect here. This water rinse will flush out any stray bits of pumpkin pulp, making the cut lines look clean, with lots of light shining through. Speaking of light, while the pumpkin is still in the sink, you can dim lights and shine a flashlight inside to preview your work. This is your opportunity to do some touch up work if necessary. If some lines look crooked, or certain holes aren't letting enough light through, trim away a little more with your most fine-toothed detail saw. And then rinse the holes with water again! The biggest enemy to the beauty of your carving is dehydration. This is a battle easily fought, however. Coating the cut edges with a thin layer of petroleum jelly (Vaseline) will seal in the moisture, so your character won't shrivel and become unrecognizable. Use your finger for large areas, a cotton swab to apply to tights spots. If you get too much Vaseline on the surface, wipe it down with a wet paper towel, and then dry with another paper towel. You only need the Vaseline on the exposed cut surfaces. If your design does shrivel, a soak in water for a few hours can resurrect it. When not on display, I tightly cover the cut holes with plastic cling wrap. And like any food item, keeping it cool also extends the life. You can put a pumpkin in your fridge, or leave outside for natural refrigeration. Just don't let it freeze, or it will turn to mush when thawed. Candles are the traditional way. Simple tea-light candles will burn for a few hours. For more burn time, votive candles may be a better choice, especially placed inside a glass holder for safety, and to protect the flame from blowing out. I personally use even larger candles, which are 2" wide x 2" tall. These can easily burn for half a day. Go with white candles, because they reflect the most light. I also recommend a long utility lighter (like those used for lighting a grill or fireplace) so you can light your candle without having to remove it from the pumpkin. If safety around your kids and pets is a concern (or you're just against the idea of burning in general) there are countless battery powered light options. LEDs are bright, efficient and come in lots of colors. Some are advertised specifically as pumpkin lights, but any puck shaped LED light can be placed in a pumpkin. These lights have another benefit -- unlike hot candles, they won't cook the inside of the pumpkin and make it shrivel faster. And of course, these flame-less lights are the only safe option if you're using an artificial foam pumpkin. Sadly, your jack o' lantern masterpieces will give way to decay eventually, but they can find immortality through pictures. Here are some things to remember when photographing your 'kin. You'll have to wait for low light conditions, but not total darkness. You'll get a more interesting image if you can see the pumpkin surface and surrounding area, rather than just showing the cut holes floating in blackness. Try outside photos at dusk, or night photos with some ambient light source nearby. With low light comes the necessity for longer exposure times. Which means your photos will be blurry if you don't hold the camera steady. Place your camera on a tripod or some stable surface. Then trigger the picture with a timer, so you don't touch the camera and risk shaking it. And if you have the inclination of a photographer, play around with different exposure and aperture settings on your camera. Staging a whole scene for your pumpkin with appropriate props is the final touch to making a stunning display. I hope these tips helped, but if you need clarification on anything, contact me and pick my brain. I'm happy to share my secrets.